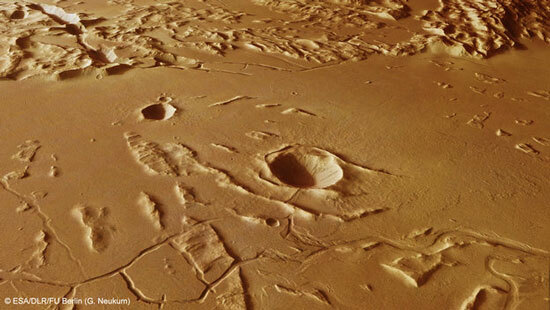 (Nanowerk News) Giant landslides, lava flows and tectonic forces are behind this dynamic scene captured recently by ESA’s Mars Express of a region scarred by the Solar System’s largest volcano, Olympus Mons. The image was taken on 23 January by the spacecraft’s high-resolution stereo camera, and focuses on a region known as Sulci Gordii, which lies about 200 km east of Olympus Mons. Sulci Gordii is an ‘aureole’ deposit – from the Latin for ‘circle of light’ – and is one of many that form a broken ring around the giant volcano, as hinted at in the context map. The aureoles tell the story of the catastrophic collapse of the lower flanks of Olympus Mons in its distant past. Today, it stands with steep cliff edges that rise 2 km above the surrounding plains. The collapse was brought about by weakening in the rocks supporting the volcanic edifice, perhaps influenced by subsurface water. During the collapse, rocky debris slid down and out over hundreds of kilometres of the surrounding volcanic plains, giving rise to the rough-textured aureole seen today. Similar avalanches of debris are also seen surrounding some volcanoes on Earth, including Mauna Loa in Hawaii, which, like Olympus Mons, is a smooth-sided ‘shield’ volcano built up from successive lava flows. The characteristic corrugated appearance of the ‘sulci’ – a geological term used to describe roughly parallel hills and valleys on Mars – likely resulted during the landslide as material slid away from the volcano and became compressed or pulled apart as it travelled across the surface. Over time, erosion of weaker material between the peaks accentuated this effect. The corrugated effect is best seen in the close-up perspective views. Zooming in on these images reveals that the hills and ridges are also covered by fine wind-blown dust, and that many small-scale landslides have occurred down the sides of the valleys between them. Similarly, on close inspection of the smooth plains, subtle ripples in the martian dust blanket can be seen. Here, thin undulating dunes have been whipped into shape by the prevailing wind. Numerous sinuous channels and jagged fracture networks also crisscross the scene, in particular at the southern (left) end of the main image and in close-up in the perspective view above. The channels range in length from around 50 km to 300 km and were probably widened by short-lived lava flows, or perhaps even by water. An impressive sight on the left side of the perspective view is a sinuous channel that is suddenly truncated by a tectonic fault. Another channel running across the centre foreground clearly has a complex fracturing history. 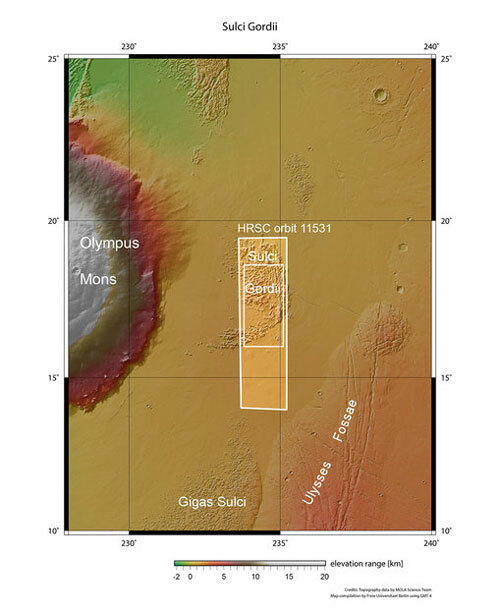 In rougher terrain towards the south, tectonic forces have torn apart the martian crust, most clearly visible in the colour-coded topography map. By studying complex regions like this – and by comparing them to similar examples here on Earth – planetary scientists learn more about the geological processes that dominated ancient Mars, when it was an active planet. Just as on Earth, the scene at Sulci Gordii tells us that volcanoes can suffer dramatic collapses that transport vast quantities of material across hundreds of kilometres, where it is subsequently sculpted by wind, water and tectonic forces.